Is anyone among you suffering? He should pray. Is anyone in good spirits? He should sing praise. Is anyone among you sick? He should summon the presbyters of the church, and they should pray over him and anoint [him] with oil in the name of the Lord, and the prayer of faith will save the sick person, and the Lord will raise him up. If he has committed any sins, he will be forgiven. The Sacrament of Anointing of the Sick has long been thought of as the Sacrament reserved only for those who are on their deathbed. 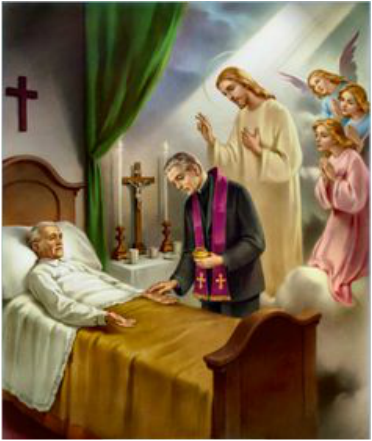 While it is true that Extreme Unction or Viaticum does include Anointing of the Sick, the Sacrament itself is actually a Sacrament of Healing intended to provide hope and divine graces during one's illness. According to the USCCB, in the Church's Sacrament of Anointing of the Sick, through the ministry of the priest, it is Jesus who touches the sick to heal them from sin – and sometimes even from physical ailment. His cures were signs of the arrival of the Kingdom of God. The core message of his healing tells us of his plan to conquer sin and death by his dying and rising. To receive the Sacrament of Anointing of the Sick, or to request further information, please contact the Parish office at (901) 465-8685. If this is an EMERGENCY please contact Fr. Robbie Favazza at (901) 229-0064.